Ever since I became a Christian, I have intended to read the entire Bible in a year. But I was always preoccupied with school activities and felt that I didn’t have enough time to finish reading the Bible. So I procrastinated for six years. But in 2017, all the members of my small group decided to read the Bible from cover to cover together in 2018. I was convinced right away that God was telling me to finish this “task”, and agreed to the plan. So, in the last weeks of 2017, I started preparing for what I needed to finish reading the Bible in the year ahead. I first picked a Bible translation that I enjoy (I personally prefer the ESV), and then got a study bible with notes that I could consult when I encountered verses that were hard to understand. I then searched for a suitable Bible reading plan. I didn’t want to pick passages to read at random, but wanted a plan that would respect the Bible’s structure and enable me to see its big picture. After comparing several plans, I decided on one which divided the books of the Bible into four categories—Psalms and Wisdom Literature, the Pentateuch and the History of Israel, Chronicles and Prophets, and Gospels and Epistles. I would read a passage from each category every day. Unlike the other reading plans, this one didn’t provide any devotional text to accompany the readings. So, I would be “compelled” to really meditate on and apply what I read in my daily life. The last matter to decide on was the best timing in the day to read the Bible. 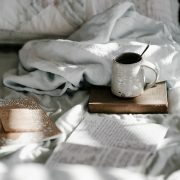 At first I tried reading in the mornings, but could never finish all the readings before having to leave for work. So I decided to read at night instead—which worked out much better for me. It might sound like I did a lot of planning, but I truly experienced the truth in Proverbs 16:9, “The heart of man plans his way, but the Lord establishes his steps” as I did so. Throughout this process, I felt as if God was the one who was establishing my path and enabling me to finish what I had set out to do. 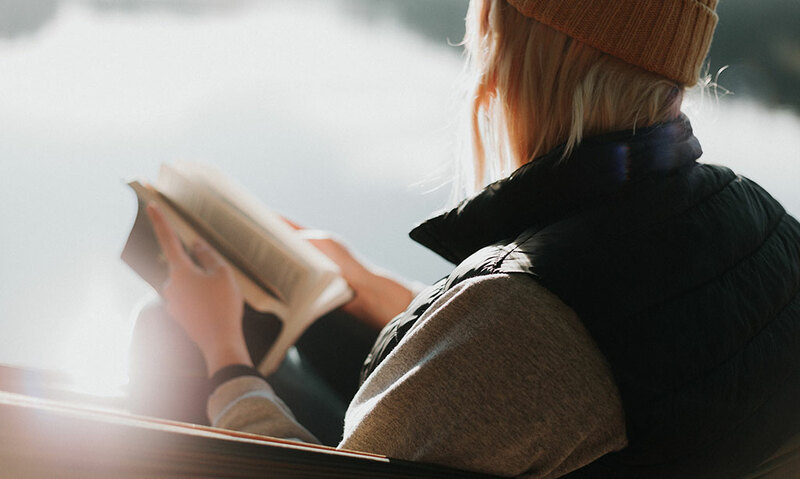 Here are three lessons I learned from reading the Bible in a year. I hope it will inspire and encourage you to read the entire Bible in the year 2019. 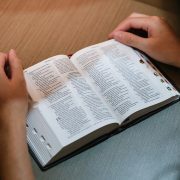 Many of us think that reading the Bible from cover to cover in one year is an incredibly hard feat. Initially, I held the same point-of-view. In the first few days, I found it hard to read four passages in one day. I was not used to sitting down and focusing on reading for such a long period of time, especially since it involved ancient Jewish literature. At times, I felt so overwhelmed that I just skipped some of the passages. But God kept bringing Psalm 1 to my mind. The psalm explains that the difference between a righteous and wicked person is this: the righteous delights in the law of the Lord and he meditates on it day and night (Psalm 1:2). He is then described as being “like a tree planted by streams of water, which yields its fruit in season and whose leaf does not wither—whatever they do prospers” (Psalm 1:3). As I reflected on this psalm, I realized that the only action the righteous man took was to meditate on the Word of God, and that kept him strong and fruitful regardless of the season he was in or what was happening around him. Even in his meditation, the righteous has to rely on God, for there’s no way that a tree could plant its own seed in the ground and grow. So if I want to be a righteous person whose life is pleasing to God, I have to spend time in God’s Word, allowing Him to mold me and teach me. This rekindled my zeal for His Word and enabled me to accomplish my resolution. Here’s the thing, it’s not that we can’t read the Bible in one year; but that we aren’t willing to put in the effort it takes to achieve it. And what a great loss that is for us! God Himself desires an intimate relationship with us. Why would we not pursue that? Since I was reading so many passages in a day, it came as no surprise that I was unable to remember all the details of what I had read. But what I can remember is the main themes and events—and it helped me appreciate the Bible from a different point-of-view. It was like finally getting to enjoy the view from a peak that I’d been longing to climb, but had only seen from snapshots other people had taken. 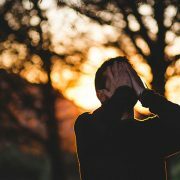 One of the big pictures that amazed me when reading through the Bible was the broad spectrum of emotions expressed in the wisdom literature (Job, Psalms, Proverbs, Ecclesiastes, and Songs of Songs). These books accurately capture the reality of ups and downs in life, from joyful times in Psalm 34 and the Songs of Songs, to the gloomy and pessimistic moments in Psalm 88 and Ecclesiastes. However, amid these uncertainties of life, the writers affirm again and again that God is present as a Rock and Refuge, inviting us to live under His wings and follow Him. I am continuing to learn how to bring myself before God sincerely and honestly, regardless of the situation I’m facing or how I’m feeling. Another breathtaking aspect of the view was learning afresh the truth that God is Love. It is such a simple fact that even children know it by heart, but who among us can truly comprehend the depth of that simple statement? So majestic is the love shared between the Father, the Son, and the Holy Spirit from the beginning that He created the world and everything in it to share this love. So holy is God’s love that He cannot tolerate sin. So deep is God’s love that He gave His one and only Son to die on the cross. It is the story of the gospel in a nutshell—but seeing God’s character in every book of the Bible, even the ones we don’t often read, really brought that truth home to me. My understanding and knowledge of the Lord definitely deepened in ways I never expected over the course of the year. Through the pages of the Bible, God causes “the light of the knowledge of the glory of God in the face of Jesus Christ” (2 Corinthians 4:6) to shine in our hearts. I would not trade this view from the peak for anything else. I have now read the Bible from Genesis through Revelation. Can I now say that I know God well? Hardly! 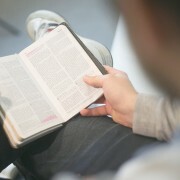 How many times do we have to read through the Bible to know God wholly? Two times? Three times? The truth is that it is not until we meet the Lord face to face that we can really know Him fully. One day, God will return and dwell among us. On that day, we will see Him face to face, and death or sin will no longer stand in our way (Revelation 21, 22). We will then be able to converse directly with the Word Himself. Until then, the Bible is the only way we can reliably know God now. We, whose minds were blinded by the gods of this world, can now see the light of the Gospel and the glory of Christ through the Bible (2 Corinthians 4:4). Though we can only know God partially because of our finite minds, He promises to meet us so that one day we can see Him fully. We may then say confidently with the apostle Paul, “Now I know in part; then I shall know fully, even as I have been fully known [by God since the beginning]” (1 Corinthians 13:12). I’m looking forward to that day! While waiting to see God face to face, let us keep growing in our understanding and knowledge of Him through the Word He has given us, which ultimately points to the true, living Word—Jesus Christ. I pray, O God, that I may know You and love You, so that I may rejoice in You. And if I cannot do so fully in this life may I progress gradually until it comes to fullness. Let the knowledge of You grow in me here, and there [in heaven] be made complete; let Your love grow in me here and there be made complete, so that here my joy may be great in hope, and there be complete in reality. 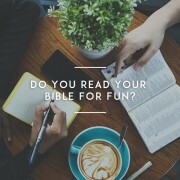 Do You Read Your Bible For Fun? Jefferson, what an achievement! Congratulations!